If you feel good, you look good, that's pretty much a given. Of course makeup enhances, conceals and makes us look like 'more attractive' versions of ourselves but we all know that those who have good skin to start with need less slap. But how does one achieve a great natural complexion? There are the undeniable benefits of a good skincare regime of course, but go one step further and the results can be even better. Here's where facial reflexology comes in. Yesterday I experienced this treatment for the first time at Anamaya - a haven of relaxation, wellbeing and general goodness tucked away just off one of my favourite places in London, High Street Kensington. I was originally booked in for a Japanese Facial Lifting Massage, but after a relaxed consultation with my practitioner Rupert, we decided Facial Reflexology would be more beneficial for my health and therefore my complexion! Using divinely scented Rosehip oil, Rupert went to work feeling around my face for any issues that may need addressing. I was genuinely surprised when Rupert touched a particular area of my face and asked if I suffered lower back pain. I certainly do. How could he know this? Was this man some kind of wizard? He's not a wizard, no (I don't think so anyway) but he is extremely knowledgeable in what the face and feet can tell about the rest of ones body, having graduated from the Central London of Reflexology in 2004. You may be a little confused about what I mean when I'm talking about Facial Reflexology - isn't reflexology something to do with feet? Originally, yes but the Facial Reflexology Sorensen system that Rupert practices is a fairly new, unique treatment developed by Danish practitioner Lone Sorensen over the past 25 years. The treatment works on the same principles as traditional reflexology - stimulating and massaging particular points and areas that correspond with various parts of the body, but it's all done via your face, which I can tell you right now is ridiculously relaxing. Rupert has treated women with stress related issues, problems with the nervous system and various other complaints and has seen particularly good results after treating ladies suffering reproductive problems. After working on my face for a good 50 minutes or so (and when I say good, I mean good), Rupert cooled my skin down by rolling a couple of cold stone spheres over my face, then I was left to wake up properly and gather my thoughts with a glass of water. Facial Reflexology can be used to treat physical and emotional issues but it's also being touted as a brilliant beauty treatment as stimulating the face in such a way can reduce the appearance of wrinkles, even out skin tone and even banish spots! I can't really describe how my skin felt after the treatment, but I will try! My face felt slightly numb but also stimulated and refreshed at the same time. Even today as I write this, almost 24 hours after the treatment, my skin is still feeling 'plumped up'. I really enjoyed this treatment and I love the fact that it's beneficial for my health as well as my appearance. Anamaya itself is a totally relaxing, calming, clean environment - a little slice of heaven in the city complete with candles, fresh flowers and an all round gorgeous vibe. 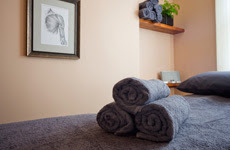 Facial Reflexology is only one of the treatments available - there are practitioners offering Acupuncture, Massage, Meditation, Reiki, Energy Healing, Homeopathy, Craniosacral Therapy and even Pilates all in one place at Anamaya. 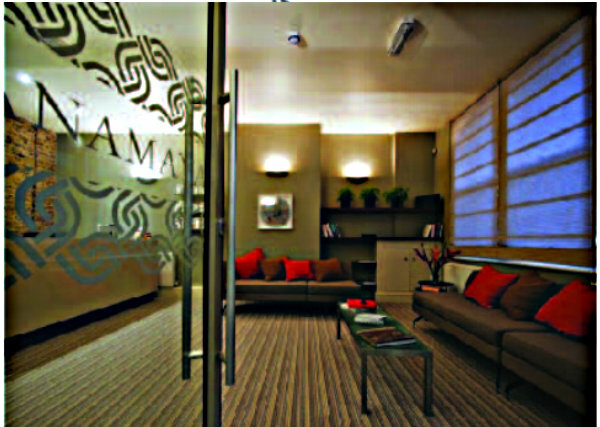 You can find out more about Anamaya, the practitioners and the various treatments and therapies on offer by visiting the website here. For more information about Rupert French and his treatments you can find him here. My experience at Anamaya was fantastic, I wouldn't take the time to write about it if it wasn't, so if you're in London and city life is getting on top of you or you'd like to try a beauty treatment with a twist I suggest you visit Anamaya. *I was given the treatment free of charge for editorial purposes but that doesn't change the fact that Anamaya rocked my world. Hey dear! I've nominated you for the Liebster award, for more information check my blog.